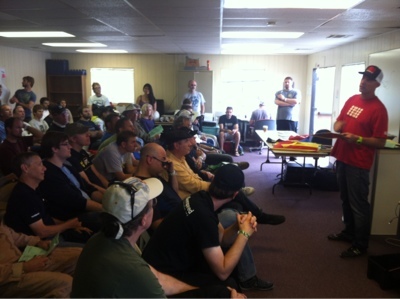 The REFUEL event is more than just a track day for electric vehicle owners. Speed Ventures is a company that trains race driving and they incorporate classroom time between track sessions. The group has just had one round of cars and bikes on the track. This may be the biggest collection of high performance electric vehicles in one place ever. There are several Tesla Modes S's, and BMW ActiveE's, and Nissan Leaf's, a couple Volt's, a couple conversion electric cars, and a big flotilla of electric motorcycles. Oh and the Kleenspeed EVX-11.